and Petite tech bag are must-have items for your business. The bags are proving to be a practical and popular item, providing a smarter way to store cables, adapters, gadgets and accessories needed to get through the working day or week. Gone are the days of stashing cables or various components in a variety of pockets, or routing around in a bag until you find what you need! Available in two sizes, the travel pouches provide an easy solution. Items can be stored neatly without getting tangled, enabling you to find what you want, when you need it. The compact sizes also mean the pouches can be easily transferred from bag to bag ensuring all essentials aren’t forgotten. A XL version of the Rio 13.3" bag, it's a great slimline bag. If you are holding an event or conference this bag provides a great option for your audience. The bag offers a soft-touch lining, with two external pockets, as well as the small carry handle the bag has a detachable shoulder strap to suit the style of the user. The bag can be subtly printed or embroidered with your logo, making it a memorable gift that will be used long after the event. In a bustling city, a rucksack that is secure and keeps valuables safe is a great reassurance for the user, while your business can benefit by adding your logo and increasing brand awareness! 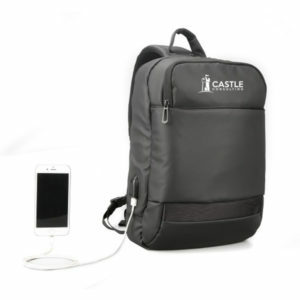 The Cityscope Rucksack with USB is a great product for employees who travel regularly visiting clients, or for those that share their time working between the office and home, helping to keep all they need in one place to support their day. If you would like to discuss our range of tech bags, get in touch to see how we can help. Call us on 01623 636602 or contact us via the website. Trendy Tech Bags for you and your audience! 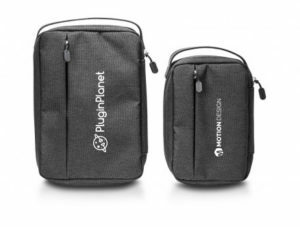 If your business is tech-savvy or have employees on the go, then we have a range of new tech bags for you and your audience to get excited about! Power Pouch tech bag and Petite tech bag are must-have items for your business. The bags are proving to be a practical and popular item, providing a smarter way to store cables, adapters, gadgets and accessories needed to get through the working day or week.